When delivered, the Artis was loaded with its v1.0 firmware and its documentation described it as the Artis Stage Piano, boasting "hundreds of excellent preset sounds (including a new German Grand Piano) already onboard ... our fully featured Kurzweil KB3 organ simulator ... [and] a very capable MIDI controller”. It therefore seemed clear what it was and what it was for, and I started to review it on that basis. I began by testing the German Grand Piano, which is based on samples of a nine-foot Steinway. I was fortunate still to have the RD800 to place next to it, and this made it possible to compare the Kurzweil not just to my Broadwood piano, but also to its immediate, digital, competition. To be honest, I thought that the Roland was the better piano, with a more rounded, luxuriant character and a greater range of tone from the softest to the loudest key strikes. Don't misunderstand me, Kurzweil's German Grand is audibly superior to the Triple Strike Piano that has underpinned its piano patches for the last decade or more, and I have no doubt that many players will enjoy its bright, rather percussive, character, which will cut through a mix to great effect. But for authenticity, the RD800 wins the medal. Next, I compared the Artis' organ sounds to those generated by the RD800. Here, the situations were reversed and I found that I much preferred the implementation in the Kurzweil, if only because its extensive control panel hardware blew the Roland's multi-screen control system away. But I also found that I preferred the sound of the Kurzweil, and I wondered whether the company had quietly improved the underlying KB3 algorithm or the chorus/vibrato, overdrive and rotary speaker effects since I reviewed the PC3K8. So, I asked them. They replied that, "the same technology and tools exist within, but extensive reprogramming efforts to both the core KB3 settings as well as the effects were applied to all-new KB3 program selections contained within the Artis”. This is ambiguous. You could interpret it as meaning that they have simply created a better selection of factory programs, but the statement about "core KB3 settings as well as the effects” leads me to hope that it goes deeper than that. Firstly, the Artis has lost the 16-channel multi-timbral Setup mode of the workstations and replaced it with a four-zone Multi (performance) mode that's equivalent in many ways to a Roland 'Live Set'. Used to control the Artis locally, or to send MIDI to external devices, you can still do many useful things with four zones, assigning them to separate MIDI channels, with individual key and velocity zones, and all manner of independent MIDI parameters, but it's not the same as a conventional multi/combi/performance mode. Happily, the Artis is still capable of receiving MIDI on all 16 channels simultaneously. You'll have to use MIDI messages from a remote source such as a DAW to select Programs and assign parameters such as level and pan to them but, importantly, each Program's internal effects are retained when you use them this way, and that's not a trivial point. Secondly, it lacks Kurzweil's 16-channel sequencer. In normal use, I wouldn't choose to use any workstation's internal sequencer in preference to writing tracks on something like Digital Performer, so this didn't bother me. However, I have to admit that I found the PC3K8's sequencer to be a useful notepad when I had it here and, if you want to use a Kurzweil to do things like replay backing tracks on stage, you'll have to jump up to one of the workstations. Thirdly, the Artis lacks the PC3K series' powerful Program arpeggiators, which can be assigned on a per-zone basis up to a maximum of 16 in a single Program and edited on-the-fly using the hardware controllers. These allow you to create sounds ranging from traditional arpeggios, to complex rhythm patterns, up to things that are almost songs in their own right. If you're attached to this type of Program, you'll again have to jump over the Artis and go straight to the top of the range. Finally, you still can't edit the Artis' Programs in detail from its own hardware; you'll always need a Mac, PC or tablet to hand. But to be honest, I always tie myself in knots when I try to programme VAST sounds using a 240 x 64 pixel monochrome display, and I would always choose to use a software editor whether I was forced to or not. In many ways, the Artis is a pleasure to use. It's not quite as sleek as a PC-series workstation nor as solid as something like a Kronos but, at just 21kg, it's not too heavy for live use, and it has an internal universal power supply, for which I commend Kurzweil. What's more, the weighted keyboard is pleasant and responsive, and while it's always a little odd to play Hammond emulations on a weighted keybed, there's nothing stopping you from hooking the Artis up to a suitable MIDI controller if that's a serious consideration. I also have a soft spot for Kurzweil's control panels, with their nine assignable faders and all their other gubbins. My major gripe, as always, is Kurzweil's continued use of that damn display, which is antediluvian when compared with Roland's high-resolution screens and, in particular, Korg's touch-sensitive monitors. Hmm, maybe that's not true. Maybe my major gripe is the lack of aftertouch. (See box.) It's a close thing. You may wonder whether being able to access the VAST engine would make any difference to the German Piano or KB3 organ sounds, but it does — a huge difference. The German Piano is merely a new sample set within the instrument's ROM, and sounds based upon it are as easily edited as any other Programs. So I dug into the Concert Grand program, which I discovered comprises 15 layers, 11 of which are based on various Steinway loops ranging from p to fff, with the others providing sounds such as pedal release 'thunk' and sympathetic resonance. It was now possible to modify each of these to create a slightly darker, warmer version of the piano, and I found this more appealing. The editor also allowed me to burrow into the architecture of the KB3 sounds, and I was able (for example) to create tonewheel organs based upon saxophones and female vocals rather than Hammond samples or sine waves, and play them through things such as ring modulators and phasers rather than choruses and rotary speakers. I wasn't intending to use these for any purpose other than giving next door's dog a coronary (the ghastly little creature woke me up at 7am this morning), but the principle holds, and you'll find that KB3 can extend far beyond what you might expect. Consequently, I feel that Kurzweil will be ill-advised to continue calling the Artis a stage piano. Sure, it has an 88-note weighted keyboard, and the company is clearly proud of its new Steinway samples, but the description is too constraining, especially when you take into account additional performance tools such as the Split and Layer modes that, for example, allow you to do things such as adding a string ensemble to your Rachmaninov piano solos, or to play a lead synth patch with your right hand while playing pads or organs with your left. Likewise (but for the opposite reason) I feel that their tag line "All-in-One Gig Machine” isn't appropriate because I don't think that you can call an instrument with no arpeggiator, no sequencer, no aftertouch and other restrictions "all in one”. After consideration, I think that I would call it The Artis Synthesizer. That's a proud name and one that, in my view, describes it rather well. When I started this review, I suggested that, if you threw away sampling, sample playback, sequencing, arpeggios, and the majority of Kurzweil's synth engine, you would find yourself with an Artis. That's no longer true. 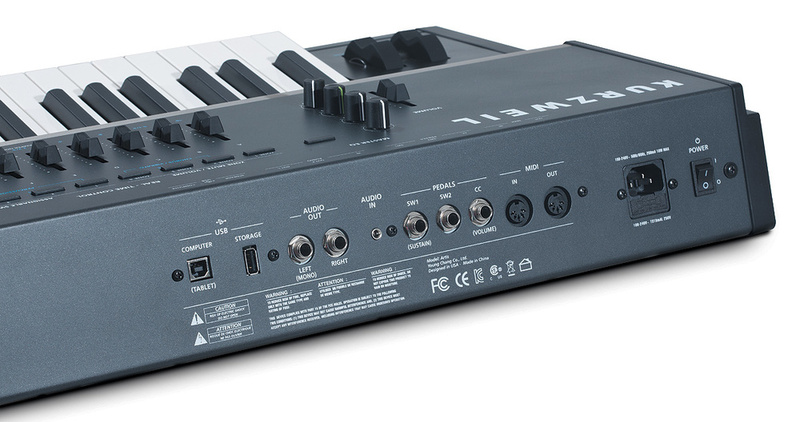 The correct statement is now, 'throw away sampling, sample playback, sequencing and arpeggios, and some of Kurzweil's synth engine, and then transfer the responsibility of editing what remains to an attached computer or tablet, and you'll find yourself with an Artis'. It's not a minor distinction. By making it possible to program the Artis in depth at home or in the studio, and then take the results on stage, the OS upgrade and editor haven't just improved a previously inflexible beastie, they have turned it into a whole new beastie. Whether there's a big enough difference or, for that matter, a big enough price difference to persuade you to buy an Artis with its German Piano samples in preference to the more fully specified and much more powerful (but not much more expensive) PC3K8 is another question. Indeed, this review has succeeded in reminding me what an excellent workstation the PC3K8 is, and I suppose that it's not beyond the bounds of possibility that Kurzweil will make the German Piano samples available as a downloadable option for its flash RAM. But, as I said at the start, Kurzweil have their own way of doing things, and I have no doubt that the Artis will appeal to players who prefer a simpler approach to their 88-note stage instruments. While the lack of aftertouch is acceptable on a stage piano (and that is, after all, where the Artis seems to have started out) it's not acceptable on an 'All-in-One Gig Machine'. The aftertouch parameter remains in the VAST engine, so the Artis can recognise it and respond to it via MIDI, but the keyboard itself doesn't generate it. This means that, like a number of similar offerings from other manufacturers, you'll have to play the Artis from another keyboard to access all of its facilities. Another area in which the Artis is cut down from the PC3K8 and its siblings is in the provision of inputs and outputs. Whereas the workstations offer a rather miserly complement of four analogue audio outputs, the Artis has just a single stereo pair. 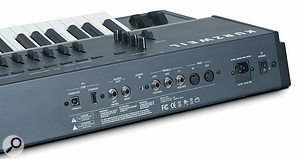 Likewise, whereas the workstations have three switch pedal inputs and two CC pedal inputs, the Artis has just two of the former and one of the latter. And, whereas the workstations offer MIDI In, Out and Thru, the Artis has just MIDI In and Out. As for the PC3K8's Sync In, Digital Out, breath and ribbon controller inputs... forget it, they've gone. Happily, the Artis retains the two USB sockets (one for accessing storage media and the other for connecting to a computer or tablet) that appeared when the PC3x evolved into the PC3K8, and it even adds a 3.5mm audio input. Oh yes, and the stereo headphone output hasn't been lost. It has migrated to the front of the instrument, where it should always have been. Once upgraded, the Artis is a very powerful VAST synthesizer. VAST synthesizers always sound great. It offers copious physical controllers and is a pleasure to play. Despite limited onboard editing, a modern screen and GUI would be much appreciated. I miss aftertouch on any 'live' performance keyboard that lacks it. The documentation now lags behind the reality. The Artis Stage Piano started life as a tweakable preset piano/organ/synth, offering a selection of sounds generated by Kurzweil's highly respected VAST synthesis engine. More recently, an operating system upgrade has exposed the underlying engine to the end-user. Lacking a sequencer, arpeggiator, sampling and sample playback capabilities, it's far from a workstation, but it's no longer a Stage Piano either. I would now call it a Stage Synthesizer, and a fine-sounding one at that.